Churma Ladoo is a famous Rajasthani, Gujarati dessert or sweet dish. It is prepared by moulding and grinding deep-fried wheat flour dumplings with sugar. You can eat churma mixture simply as it is or can shape them into small balls and then devour them. Anyway, this is one of the sweets that never lets you down. So, here’s my simple and step by step Churma Ladoo recipe just for you! Desserts like Sour Cream Pound Cake | Pumpkin Dump Cake | Hot Spiced Fruit Cake are surely worth making and gorging on repeats. But, nothing beats our good old Indian sweets and desserts. Mainly because many of them are healthy, nutritious and seasonal. 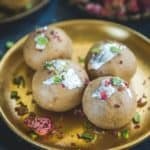 When it comes to Indian desserts, of course, there are many options. Mostly, it goes without saying that you would love Basundi | Gajar ka Halwa with a hind of nutmeg powder, cardamom powder any day. But, there is something about Churma Ladoo that hits all the right notes on almost every occasion. In Sanskrit, the word ‘ladoo’ means small balls. You can make these fine powder | stiff dough delights on Ganesh Chaturthi – Lord Ganesha’s arrival every year. On the other hand, you may serve them after a proper festive meal as well. 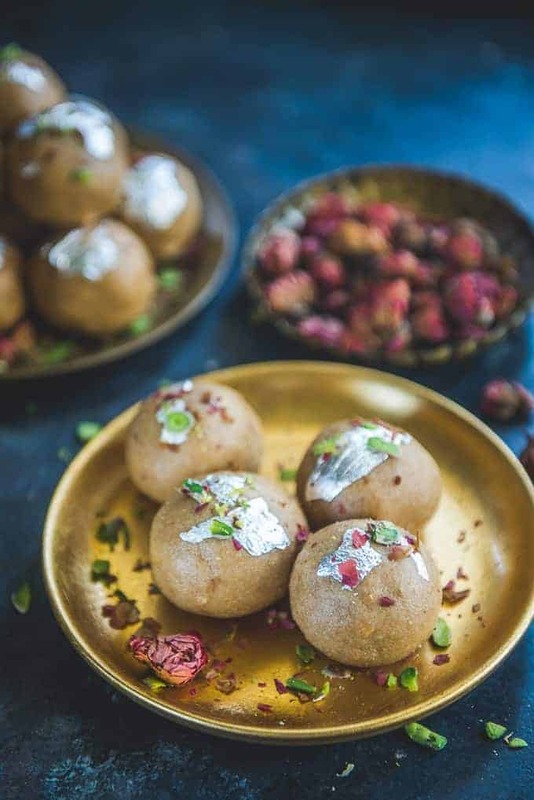 Not to mention, that as they are loaded with dry fruits, ghee, wheat flour – all finely cooked on a medium flame with ghee, their aroma is simply unforgettable. Plating wise they look golden brown. Talk about the taste and the texture, they both are simply heavenly. With a tinge of dairy fresh ghee, poppy seeds to top it all up, they truly turn out finger-licking. Many people use jaggery as a sweetener, however, I like using powdered sugar. Either way, they turn out delicious. Add 1 tbsp ghee in whole wheat flour and mix nicely with your fingers. Knead a tight dough using warm water. Keep covered for 10 minutes. Knead again for a minute and divide the dough into 6 pieces. Make balls of the dough and roll into 1 cm thick disc. Heat ghee in a pan and deep fry the discs on low - medium heat till they are golden brown. Keep the fried discs covered till they cool down. Meanwhile, fry the chopped almonds and cashew nuts in a tbsp of ghee and keep aside. Break the discs into small pieces and coarsely grind in a blender. Add the remaining ghee in a pan and add the ground mixture. Fry the mixture for 2-3 minutes on medium heat. Add the fried dry fruits, powdered sugar and cardamom powder in the mixture and make small ladoos. Store in an airtight container for 10-12 days. My Mom makes Amazing Churma Na Ladoo as we call in Gujarati 🙂 the Recipe is the same but it does not so Glam like these Ladoos! loved the way you have styled it !